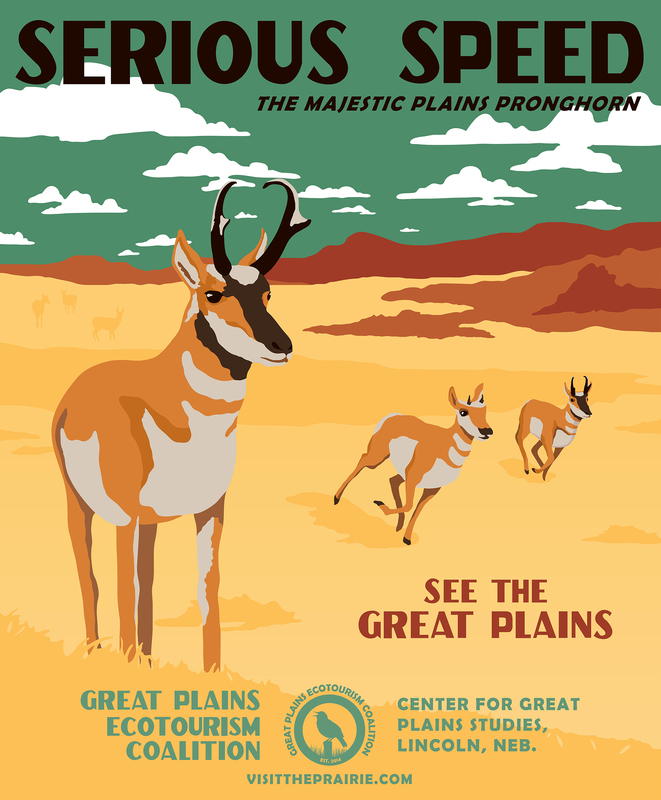 This year we’re creating six new posters for the Great Plains Ecotourism Coalition that highlight other states in the Great Plains. The first was the black-footed ferret for South Dakota, which we unveiled last month. This month we’ve got another classic Plains mammal, the pronghorn. No better day to release this guy than Earth Day. The pronghorn is the king of speed. It can run at close to 60 mph and can maintain fast speeds for longer than a cheetah. Some researchers have theorized that this speed is an evolutionary byproduct of the need to outrun a cheetah-like cat that died off with other mostly-lost megafauna like the mammoth. The pronghorn make one of the longest land migrations in the continental U.S., a 300-mile trip that requires surviving novel obstacles like fences, cars, and human development. Environmental organizations across the country are now joining forces to help create a corridor for pronghorns and other species to migrate. The pronghorn in this series represents Wyoming. Bands of these animals migrate between Wyoming’s Upper Green River Basin and Grand Teton National Park. This poster is available for purchase at the Great Plains Art Museum or by emailing cgps@unl.edu.